The Monday, March 30, 2015 Climate Justice Forum radio program hosted by Wild Idaho Rising Tide (WIRT) gratefully welcomes Bill Moyer, a co-founder and executive director of Backbone Campaign at Vashon Island, Washington. Bill discusses Solutionary Rail, a bold, thoughtful, and effective vision for transforming the Northern Transcon section of the Burlington Northern Santa Fe Railroad between Chicago and the U.S. Northwest into an environmentally sound, electrified rail corridor that could sustain communities, commerce, and alternative energy. Broadcast on progressive, volunteer, community station KRFP Radio Free Moscow every Monday between 7:30 and 9:30 pm PST, live at 90.3 FM and online, the show covers continent-wide climate activism and community resistance to dirty energy developments, thanks to the generous, anonymous listener who adopted program host Helen Yost as her KRFP DJ. 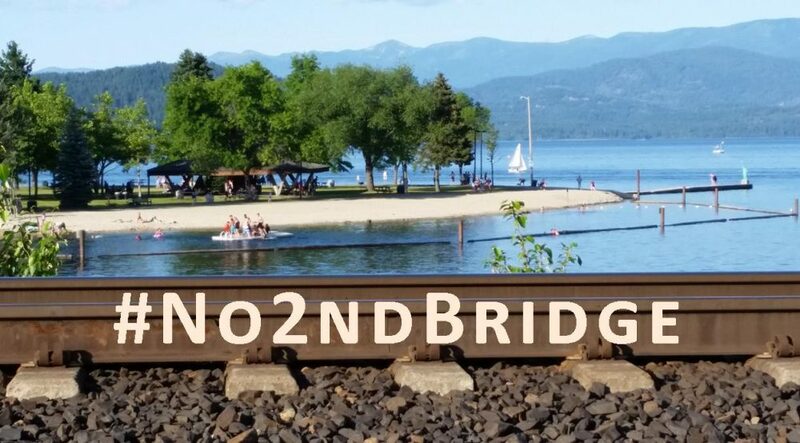 The fourth year of relentless Wild Idaho Rising Tide (WIRT) activism has manifested plenty to celebrate! We invite and welcome everyone to the Fourth Annual Celebration of Wild Idaho Rising Tide, commemorating our anniversary as a direct action collective and reinvigorating our members, friends, and supporters for another year of dedicated commitment and involvement in the passionate climate justice movement. This yearly fundraising party supports WIRT activists, who confront the root causes and perpetrators of climate change by asserting direct actions and promoting locally organized solutions, in solidarity with frontline communities of resistance and an international, volunteer, grassroots network of activists. We eagerly anticipate hosting another lively, evening gathering, enjoying shared camaraderie, live music and dancing, and exuberant fun. 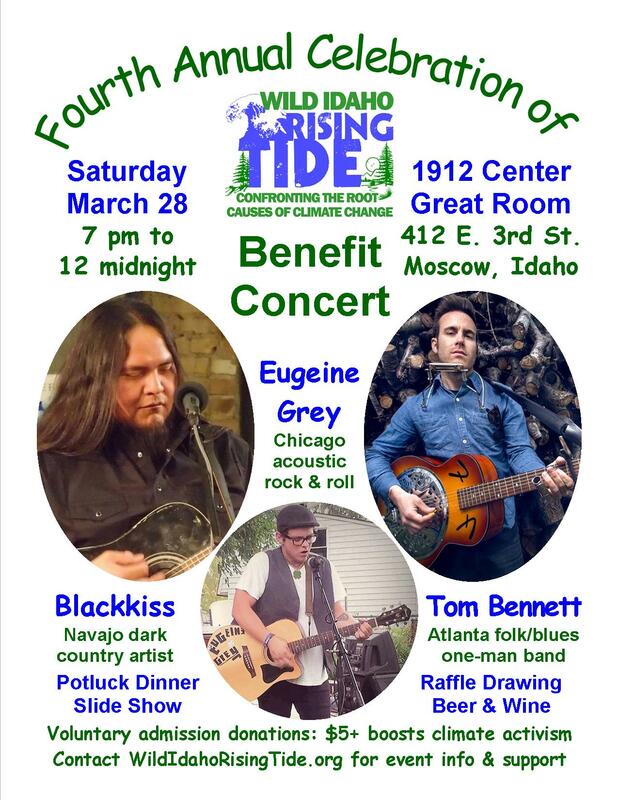 Between 7 pm and 12 midnight on Saturday, March 28, revel in a benefit concert provided by three bands, along with a home-cooked, potluck dinner and desert, beer and wine for purchase, and dozens of raffle prizes donated by community members and businesses. To savor our successes, hundreds of selected photos of our demonstrations and initiatives will cycle through a background slide show. Please join dirty energy resisters at the 1912 Center Great Room, 412 East Third Street in Moscow, Idaho, for a well-deserved wild time full of spirited conversation and inspiring music played by remarkable, visiting songwriters and performers. The Monday, March 9, 2015 Climate Justice Forum radio program hosted by Wild Idaho Rising Tide (WIRT) will discuss recent issue updates on Alberta tar sands and Bakken shale oil trains, the Great Falls refinery expansion involving recent megaload transports, and oil and gas legislation and leasing in southwest Idaho. We will air recordings of March 2 and 4 Idaho Senate Resources and Environment Committee hearings on Senate Bill 50 advancing unitization of mineral leases, which compromises private property rights, mortgages, and insurance. Broadcast on progressive, volunteer, community station KRFP Radio Free Moscow every Monday between 7:30 and 9:30 pm PST, live at 90.3 FM and online, the show covers continent-wide climate activism and community resistance to dirty energy developments, thanks to the generous, anonymous listener who adopted program host Helen Yost as her KRFP DJ.